The initial deposit when opening an account with Spectrum Live is AUD $10,000 and for Spectrum Live Options Trader USD $5,000. To fund your Spectrum Live trading account, you must first make a direct deposit in Australian Dollars to the Australian Financial Market Services Limited FX Trust Account (details below) where it will be held on trust for you. You may deposit funds by direct deposit or using BPAY. Should you wish to fund your account with another currency, please contact your advisor. Full details of our trading costs, commissions and charges for all the products we trades can be seen in our Commissions, Charges and Margin Schedule. What products will I be able to trade? How do I trade Spectrum Live products? All Spectrum Live products can be traded through our Spectrum Live Trading Platform. In addition to live trading and direct access to your account, Spectrum Live offers a wealth of trading information such as real-time quotes, charts and analysis from our own in-house analysts to help you make successful trading decisions. If you need assistance making a virtual trade, your are best to open up your Spectrum Live Trader click “OK” to any upgrades and then press “F1”. This will immediately take you to the support desk where you can watch the “Client Station Walk-through”. This will demonstrate for you exactly how to make a trade. How secure is trading through Spectrum Live? Spectrum Live authentication relies on an RSA 1024-bit key generated and stored on the client workstation. Data traffic between Spectrum Live and the bank is encrypted using a RC4 128-bit session key. Spectrum Live provides a highly secure trading environment using state-of-the-art encryption for communications with the bank. What are the minimum computer specifications? Microsoft Internet Explorer 6 or later must be installed. Microsoft Internet Explorer 8.0 is recommended. The browser does not need to be configured as your default browser. 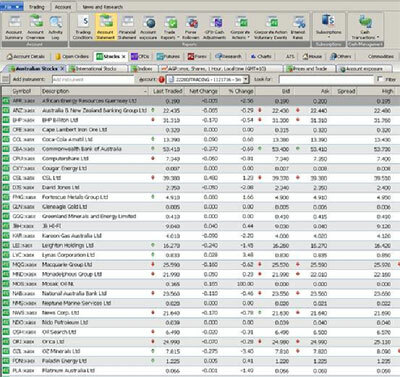 In order to view some of the analysis pages incorporated into the SaxoTrader, Adobe Acrobat Reader must be installed. Adobe Flash Player 6.0 or later is required to view some elements of the online Help. The latest version of the program can be downloaded from Adobe. Java virtual machine must be installed to view Instrument Information pages. Important: In order to view charts .NET 2.0 or higher must be installed. It is possible to download and install.NET 2.0 Service Pack 1 by clicking here. In order to view some of the analysis pages in SaxoWebTrader, Adobe Acrobat Reader must be installed. The latest version of the program can be downloaded from Adobe. What service will I receive as a Spectrum Live client? Even though most trading is done online, we take pride in the level of personal service that we offer our clients. As a new client, you are assigned an Account Executive when you first open an account to help you to get trading as quickly as possible. There is also a 24 hour / 6 days a week, support desk which you can take advantage of. If you need assistance whilst your making a trade, our “Live Trading” desk will be very helpful to you. I am having problems downloading the live chart and news on the platform, what do i do? There are 2 reasons for this! 2) This challenge occurs due to your Firewall or Anti-Virus settings. It is recommended, that to allow this content to download onto your computer that you minimize your security settings on your virus protection software. It is very easy to go back to your original default settings. The first step is to click on "File" in the top left hand corner. Then go down to where it says "1 SpectrumLiveDefault.wsp"
As soon as you click on this, you will be taken back to your original default settings and you can begin your "Virtual" or "Actual" trading again. To obtain account statements for your Spectrum Live Account please follow the below instructions. · Multiple statements can be generated but the statements of most relevance for tax purposes and records are "Account Statement", "Financial Statement" and "Trades Executed". Multiple statements can be generated but the statements of most relevance for tax purposes and records are "Account Statement", "Financial Statement" and "Trades Executed". Login into your Spectrum Live Options Trading account and click on "Account" along the top of the screen, then select "Account Management Home"
Enter your Spectrum Live Options Trader Username and Password on the Login page. Select "Report Management" from the menu on the left hand side of the page. Select "Activity Statements" from the sub menu under "Report Management". From the options provided please select your statement criteria and then click "View".